Marshall M. Fredericks Sculpture Museum | Sketches for "The Romance of Transportation"
Sketches for "The Romance of Transportation"
When Fredericks first started designing this sculpture he thought of using many forms of transportation rather than just a large train. The imagery relates to the notion of the iron horse, the name given to early trains. 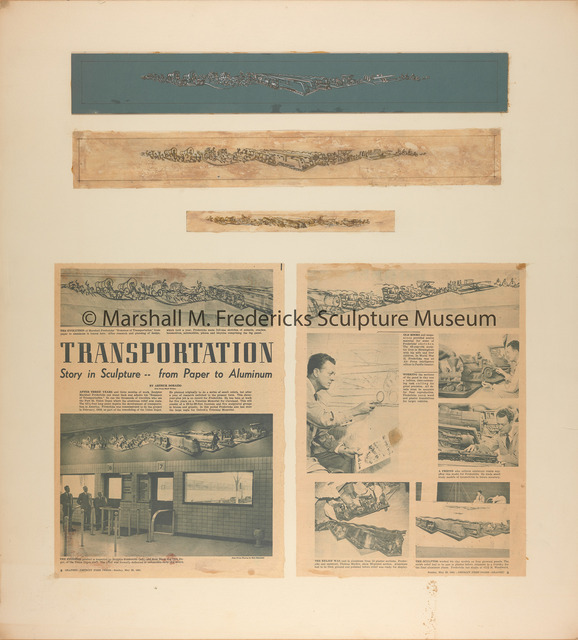 Fredericks, Marshall M., 1908-1998, “Sketches for "The Romance of Transportation",” Marshall M. Fredericks Sculpture Museum, accessed April 20, 2019, http://omeka.svsu.edu/items/show/7044.